I love redesigning my old t-shirts for lots of reasons. It keeps my wardrobe fresh, which keeps me from getting bored and spending money on new clothes. Also, I like skating in edgy/cute/cut-up outfits. Plus, imagining how to redesign a t-shirt is a fun way to spend a morning coffee break or an afternoon workout (or both). For this particular t-shirt redesign, I wanted something with a drapey, open back, but I didn't want it to be so open that it would fall off my shoulders and bother me while I was skating. 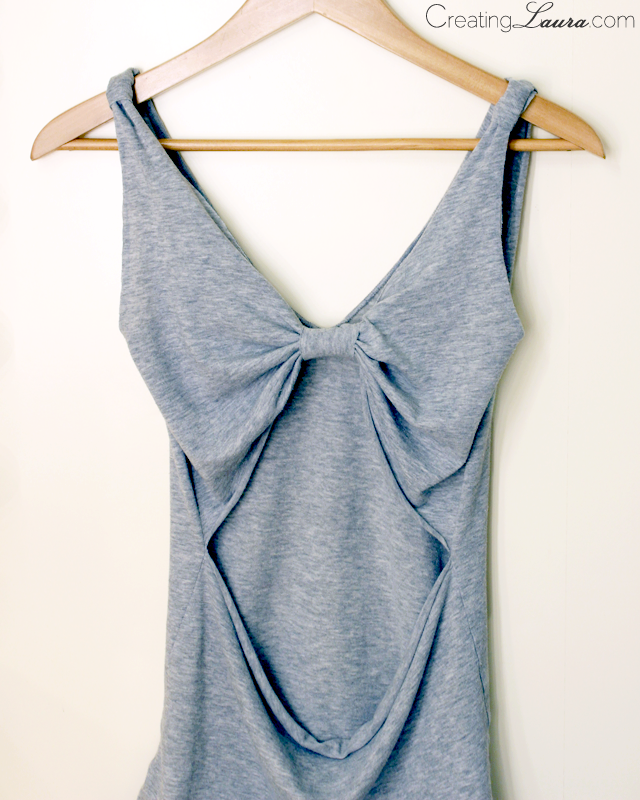 The simplest (and prettiest) answer was a bow similar to the ones I made on the sleeves of this t-shirt. 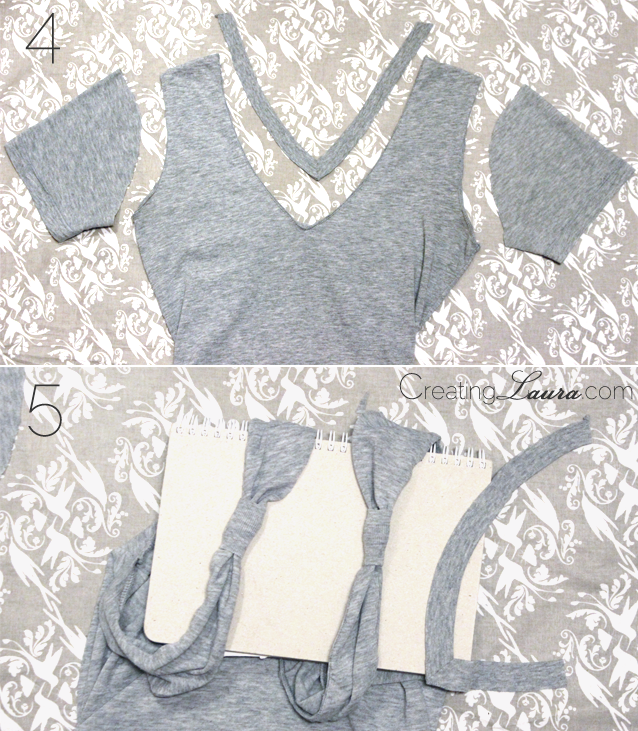 If you want to make this top too, you'll need an old V-neck t-shirt, a pair of scissors, and some glue (I used E6000). 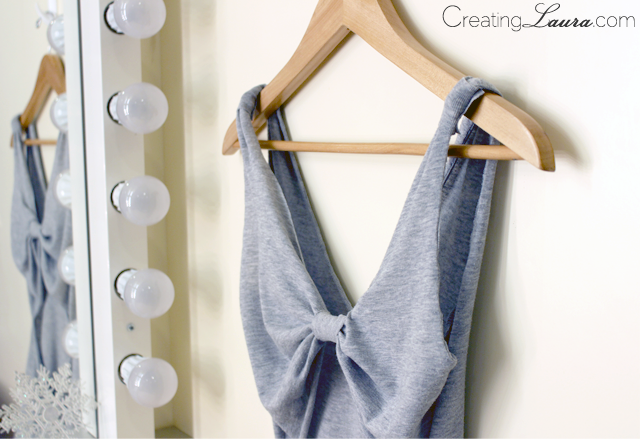 Make sure the shirt fits a little bit loose because creating the bow at the back will tighten it up a little bit. 1. 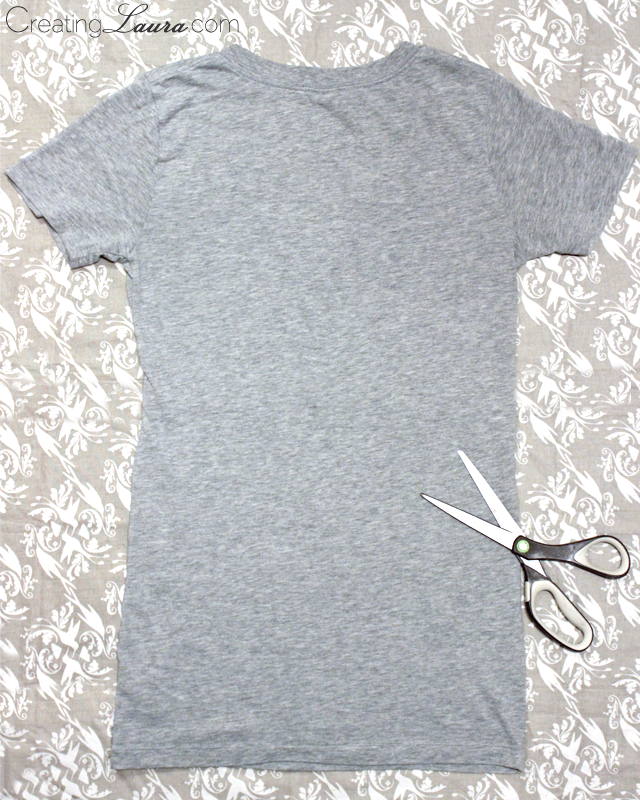 Cut a half-circle out of the neckline that's about 4 inches deep into the back of the shirt. The lower you cut this half-circle, the lower the bow will sit on your shirt. Next, start at the bottom of each armpit, measure 6 inches down the side seams, and make a little mark with a pencil. Cut straight across the back of the shirt between your two marks being very careful to cut close to the side seams but do not cut through them. Those side seams will keep the horizontal slit you just made from growing and growing until the shirt isn't wearable anymore. 2. Insert your thumb into the horizontal slip and your forefinger into the half-circle at the neckline and pinch your fingers together. This is where your bow will be. If you're not happy with the placement, now's the time to cut the neckline a little deeper to correct it. Once that's all sorted out, cut a 4 inch x 2 inch strip of fabric out of the extra fabric that you cut from the neckline. 3. Wrap the fabric strip around the spot that you pinched and glue it in place on the inside of the shirt. To keep the glue from leaking onto the front of the shirt, place a piece of cardboard or a notebook in between the front and the back of the shirt. Let the glue dry fully before moving on to the next steps. 4. Turn the t-shirt over so the front is facing up. Cut off the neckline just outside of the seam that was used to the keep the neckline on the shirt. Leaving that seam on the finished product will help it last as long as possible. Now cut off the sleeves, also cutting these just outside of the seam so that seam stays on the shirt for structural support. 5. Cut two strips off of the scrap fabric that used to be the neckline. Wrap each strip around the top of each armhole to hold the straps in place in an aesthetically pleasing way. Glue them in place on the underside of the strap. Let the glue dry completely before trying on your finished creation. I put mine on and skated around a bit this afternoon. This shirt definitely achieved the drapey look in the back without becoming too loose to skate in. I can't wait to wear it on our warmup ice tomorrow before the shows! If you decide to make this shirt too, I'd love to see a picture of yours too! This is SOOOO Cute as a button! Just chillin' in Studio B in your too cool for school DIY shirt! Oh it's so cute! 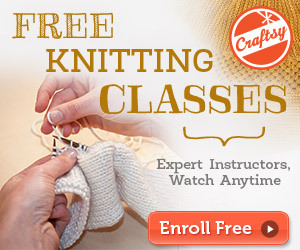 It looks amazing, especially on! I just realized the shirt I'm working with doesn't have side seams! Any tips for preventing the horizontal slit from growing? 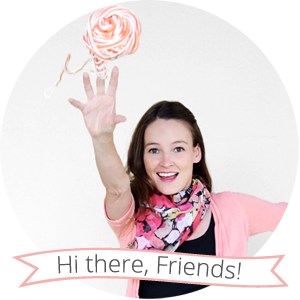 You have the cutest blog EVER! I love that you love DIY and ice skating, I don't generally see that combo. I'll definitely be adding you to my Bloglovin' queue. 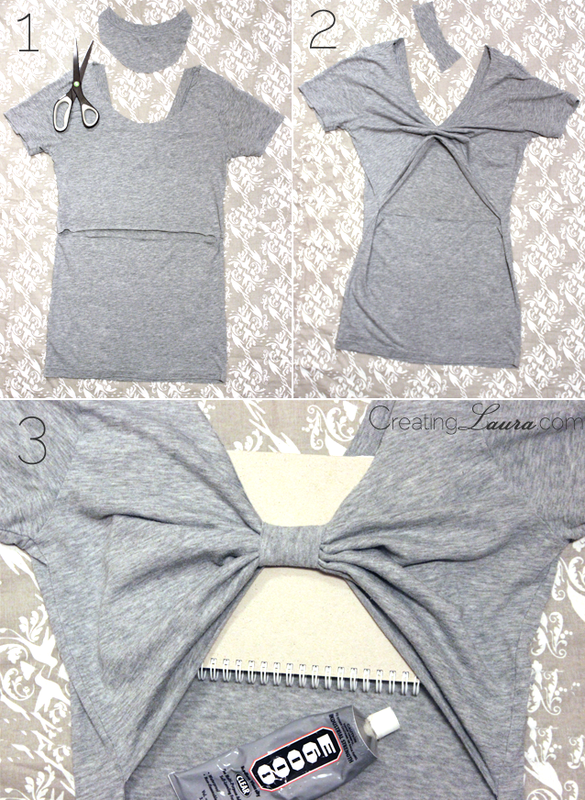 I've only ever seen shirts where you make a bow separately and then sew it or add it with fabric glue (https://omghow.com/articles/make-diy-bow-back-t-shirts-for-summer-718ce7c1-74ad-4bd2-be57-365bfd0d8889) so this really surprised me. This bow looks so feminine yet still emphasizes how fit your back is, I can't wait to try it!! This is so cute! I can't wait to try this. <3!! !